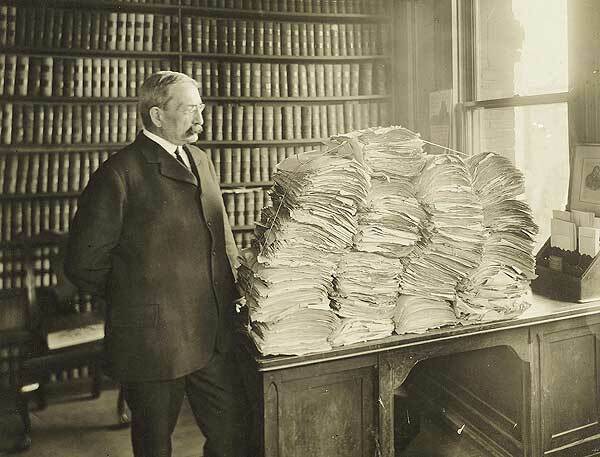 His apparent age in this undated image suggests that Williston has posed with the draft manuscript or the notes for his great treatise on contracts. When Samuel Williston, A.B. 1882, LL.B.-A.M. ’88, died at the age of 101, Time magazine took notice, describing his enormous influence on twentieth-century American law in an obituary titled “A Yankee Socrates.” Williston had drafted several important commercial statutes and had written systematic works on sales and contract law; today, more than 80 years after its publication, the contracts treatise still lands him on lists of the most widely cited legal scholars. Time also discussed Williston’s decades-long career at Harvard Law School and the affection that colleagues and former students had for the man: a gentle, good-humored teacher who charmed his classes with hypothetical cases involving his horse, Dobbin, and who regularly invited students to dine with his family on Sundays. Yet Time omitted one of the most salient features of Williston’s long life. In his mid thirties, he suffered a nervous breakdown that caused him to stop work for years at a time. Diagnosed with “neurasthenia,” he took extended leaves of absence, attending different sanitariums in search of a cure. Eventually, with the help of what we would today recognize as a combination of drug and cognitive therapy, he worked his way to a kind of recovery that allowed him to pursue his enormously productive career. Williston was born in Cambridge; his family, once well-off through the button trade, lost most of its fortune in bad investments during his youth. Though hardly poor, he developed an insecurity about finances that never left him. He was an indifferent student at the College, where his lack of money hurt his social standing, but did extremely well at the law school, graduating at the head of his class. After a Supreme Court clerkship and a short stint in practice, he returned to the school in 1890 to teach. “No personal associations could be more pleasant,” he would later write of his interactions with his new colleagues. Yet in 1895, just after becoming a full professor, he had his breakdown. He lost his appetite and his ability to concentrate and developed muscle fatigue and severe insomnia. Thinking himself overworked—in addition to teaching, he had continued to practice law to support his growing family—he took a leave of absence for the remainder of the academic year. He planned to travel. It soon became apparent that he needed more than a vacation. Neurasthenia, or nervous exhaustion, was a common diagnosis during the Gilded Age, particularly for “brain toilers” like Williston who were thought to be particularly susceptible to the strains that modernity placed on the nervous system. The catchall term covered various mental disturbances, including what we would today call depression and anxiety disorder. People understood the condition to be chronic, debilitating, and potentially incurable. Williston’s leave extended to four of the next five academic years. He tried drugs, rest, travel, occupational cures, and “hydropathic” treatments; nothing worked. Finally, in December 1899, at his wife’s urging, he checked into a sanitarium run by Dr. John Gehring in Bethel, Maine. (So many of Harvard’s faculty were among the patients that the sanitarium was known as the University’s “resting place.”) Gehring prescribed heavy doses of sedatives to make his patients suggestible and then used talk therapy—as well as hypnosis—to encourage them to identify and resist their harmful “obsessions.” He told them that recovery would come when they learned to think in new ways, when they discounted their subjective negative emotions and focused on objective reality. The treatment seemed to help Williston. He returned to full-time teaching in the fall of 1900 and never took a leave of absence again. Although he suffered periodic relapses that sent him back to Bethel and to other sanitariums over the years, and never weaned himself entirely off sedatives, he was able to work steadily. He was a fixture at the law school for the next five decades, teaching into his eighties and doing research into his nineties. He never really accepted the nature of his illness. Even after Gehring had begun to treat his condition as a mental disorder, Williston maintained that he had simply overtaxed his nervous system. Although his autobiography reveals a young man beset by anxieties about money, status, and his skill as a lawyer, he insisted, “My downfall was not due to any mental twist.” He attributed his recovery to driving himself less hard—“a little every day”—and taking better care of himself. Mark L. Movsesian ’85, J.D. ’88, is a professor of law at Hofstra University.